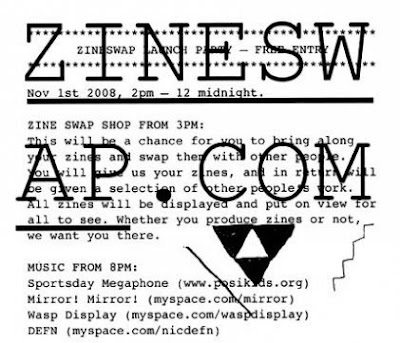 Zineswap aims to be a resource through which people can swap their zines with one-another. It also aims to become a vast archive of contemporary zine publishing, existing as both an online catalogue and an annual exhibition. Next saturday, November 1st will see the launch of Zineswap with a party at The Rag Factory.This will be a chance for you to bring along your zines and swap them with other people. You will give ZIneswap your zines, and in return will be given a selection of other people's work. All zines will be displayed and put on view for all to see. Whether you produce zines or not, they want you there. Zine swap will kick off at 1pm with the zine swap from 3pm. There will be music through out the day with DJ's providing the music until 8pm when the live bands take over. Bring your own booze to the party.